Bob R and I went up to Tom's and dropped off some rods for repair. The rod I dropped off was my hands down, absolute favorite rod. I have used this rod for many different presentations over the years but was originally purchased for pitching/flipping and Mann's 20+ crankbaits. I have fished worms with it and actually won a club tournament that way. It was made by Gator out of Florida. It was my first venture into the world of seven foot rods and I think it is extremely light for its size. Tom has totally stripped the finish off the rod, static tested it and tied on a new set of guides and refinished everything. I have not seen it yet but Bob has. He saw it during the refinish and said I wouldn't recognize it. I told Tom that I was more of a utilitarian kind of guy and didn't need a flashy finish pattern. Originally the wraps were kind of a burgundy with a dark silver ring on the end. Hoping to pick up the rod on Saturday or Sunday this week. I am sure I will be impressed with Tom's finished product. Can't wait to pick up Old Faithful. So much water, so many fish, so little time. Hoping Tom has before and afters but I am not sure. It had a serious case of "rod box measles" from its time doing club and open tournaments back in the day. This is the only rod that I kept out of the 14-17 rods I used to carry back then. This rod has always amazed me at how sensitive it seems to me for its action. I would call it an XH with an extremely fast tip. It has been described by friends as a telephone pole but I can still feel the pick up on 4" worms. This is one rod I would never get rid of. Ok, lol. Hopefully Tom will have B & A pics. I was told there are no before and afters so I took some after shots. I am going to apologize ahead of time for the pictures of the eyes because they are blurry. First an explanation of what it looked like before the re-wrap. 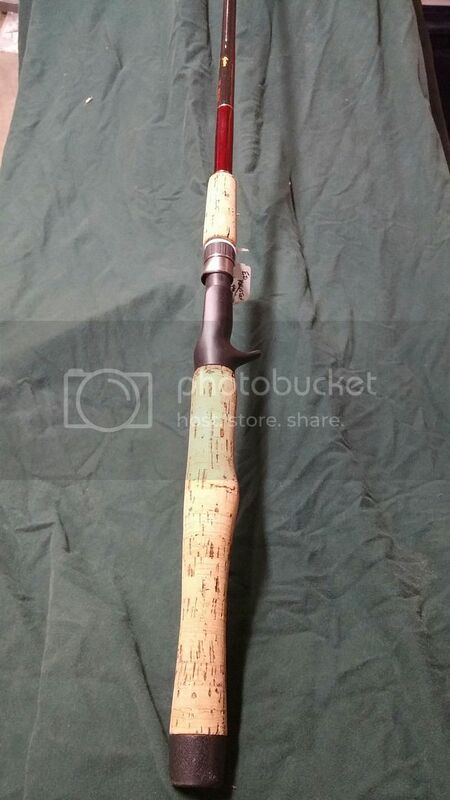 I have owned this rod since the early to mid-nineties. I think a friend of mine had won it in a tournament and didn't want it. I bought it from him for pitching and flipping with LOTS of backbone. It is for 1/2 to 2 oz lures and up to 25 lb test line. I have used this to fish Texas rigged 4" plastic worms and it is sensitive enough to do that. On the blank, Between the eyes, there were what I referred to as rod box measles. Anytime that something touched the finish it chipped off a little of it leaving a dit. I told Tom that I think whatever the finish was that it was too hard. I had also told Tom that I thought it might need an additional eye on the blank to be right. Tom did a stupendous job on "Old Faithful" and I am extremely happy. He completely stripped the finish from the blank, static tested to check the eye arrangement, checked the spine, retied and refinished the complete rod. Believe me, that cork did not look that good when I took it to him. Here are the pics. Again I apologize for the two of the eyes.